The fossils were discovered in an area of Western Australia that is well known for its preservation of fossilized organisms. UW-MadisonA photo of the rock samples analyzed by UW-Madison researchers. 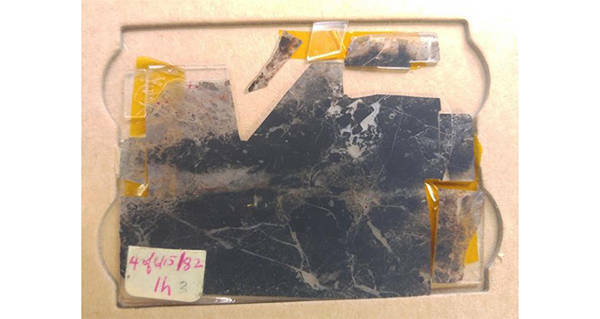 A new study, published by the University of Wisconsin-Madison in conjunction with UCLA, claims that researchers have found what appear to be the oldest fossils ever recovered. Researchers at the two universities have been studying a piece of rock found in Western Australia, and have confirmed that the fossils inside date back almost 3.5 billion years, making them the oldest fossils ever found. The fossils are known as microfossils, as they are so small that they are invisible to the naked eye. In fact, each one of them measures just 10 micrometers wide – for scale, eight of them could fit along the width of a single human hair. The microfossils were first noted in 1993, by UCLA’s J. William Schopf, the director of the Center for the Study of Evolution and the Origin of Life at the university. Schopf first described them in a science journal, after he was drawn to their unique cylindrical and filamentous shapes. In 2002, he published another paper on them, suggesting they may be biologic entities, and not just mineral or geologic anomalies. Finally, Schopf has proof. Using a secondary ion mass spectrometer at UW-Madison, researchers were able to separate the carbon in each fossil into isotopes and measure the ratios. The ratios then helped to determine that the fossils had once been living creatures. That group of organisms was, more specifically, micro bacteria. The results showed 11 different microbial specimens, from five separate organisms. Some of the organisms were from a family known as Archaea, a group of bacteria that produced methane gas. Others were forms were of gammaproteobacteria, a group that consumes methane gas. The discovery of the gas producing and consuming organisms could help scientists understand how life forms may have survived in an atmosphere that was low in oxygen. Additionally, the researchers discovered phototrophic bacteria – bacteria that relied on the sun for energy. Again, this lends itself to research on how organisms could have survived in a climate entirely different than our own. Though the fossils were only recently identified, their host, the rock itself, was discovered in 1982, in an area of Western Australia known as the Apex chert deposit. The area is one of the few places on the planet where geologic evidence is able to be preserved, as it is free from geological processes such as burial and extreme heat due to tectonic plate shifting. According to an earlier study, the oldest fossils found were 4.3 billion years old, inside rocks located in Quebec, Canada. The director of the UW-Madison study, John Valley, claims, however, that that study was not as concrete as this most recent one. Next, check out more interesting organisms that have been found during explorations into Australia. Then, check out some of the world’s oldest living fossils.